Don Mills: McClelland and Stewart Limited, 1962. A young Berton at his witty best. 185 pp. Orange cloth covered boards have black text on spine and front panel. Fon inside front board. Spine ends are slightly rubbed, small bump to bottom front corner. Unclipped, unpriced DJ has edge wear with chip at base of spine, vertical smudge accross front panel. Bookseller's Inventory # 05523.. First Edition, second Printing. Orange Cloth. Very Good/Very Good. Illus. by George Feyer. 8vo - over 7¾" - 9¾" tall. Toronto: McClelland and Stewart Limited, 1962. 186 pages, with black and white illustrations throughout. Orange cloth covers with black titles, top and base of spine lightly bumped and worn, endpapers and text are very lightly yellowed, VG+. Illustrated white dust jacket with black, brown, purple, and orange titles, top and base of spine, corners are lightly bumped and chipped, edges are lightly worn, top edge worn with small tears throughout, a few spots here and there, Good.. Hard Cover. VG+/Good. Illus. by Feyer, George. Don Mills, ON, Canada: McClelland and Stewart Limited, 1962. 1st Edition. Hardcover. Very Good Plus in Very Good DJ. Feyer, George. 8vo, Orange boards with black letters and graphics. Previous owner's name on the front free page. The corners are sharp. DJ has eleven tears to one half inch and a quarter inch chip at the top of the spine. 185 pages. Toronto: McClelland and Stewart, 1962 Bright orange cloth on boards. Tiny chips head and foot of DJ. Chapter titles include: All My Own Work, Five Dilemmas of Our Time, The Canadian Way of Life, The Writing Game, Seasonal Reflections of a Country Dweller, and Dreams and Daydreams. This material first appeared in the Toronto Daily Star. 185 pp.. First ( No Additional printings). Hard Cover. Very Good/Good Plus to Very Good. Illus. by George Feyer. 8vo - over 7¾" - 9¾" tall. McClelland & Stewart, 1962. pp.185 clean tight copy d/j shows small tear to front lower right corner, 3/4" tear to top back on spine hinge with creases, else slight wear to extremities of creases, tears, slight bumping to boards of top/bottom spines and corners. First. Hard Cover. Near Fine/Very Good. Illus. by George Feyer . 8vo - over 7¾" - 9¾" tall. McClelland & Stewart, Toronto. Used - Good. Shows some signs of wear, and may have some markings on the inside. Toronto: McClelland & Stewart, 1962. Book. Illus. by George Feyer. Very Good. Hardcover. First Edition. edge wear, small edge tears, some minor soiling, age discoloring to jacket. previous owners inscription on first blank page. McClelland & Stewart, Toronto , 1967. Mass Market Paperback. Fair. Paperback. Sound & good copy, mild creasing, light to moderate shelf/reading wear, stamped, lean to spine, name blacked out to front wrap. McClelland & Stewart, 1962 Orange boards, DJ chipped around edges, clean solid copy. Previous owner's name stamped on ffep.. Hard Cover. Very Good/Good. Toronto: McClelland and Stewart, 1967. 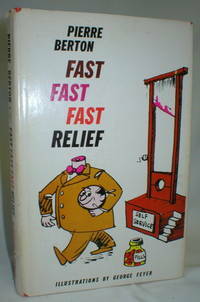 A collection of Berton's articles, with illustrations by George Feyer. A little wear to the ends of the spine.. Paperback. Good.